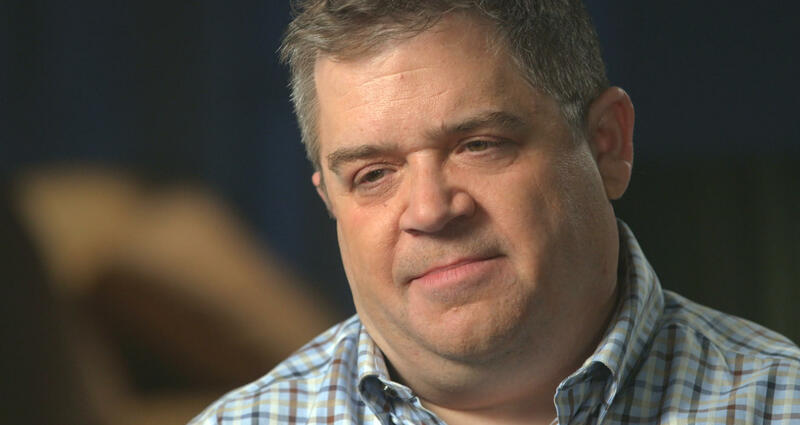 Patton Oswalt has talked openly about how difficult life has been since his wife, Michelle McNamara, died in April 2016, but the comedian has found love again. Oswalt's publicist confirmed Thursday that he is engaged to actress Meredith Salenger. The couple made their first public outing at the Los Angeles premiere of "Baby Driver." Salenger tweeted her love for both the comedian and his daughter. She wrote on Instagram and Twitter, "It's official. I'm the luckiest happiest girl in the universe!!!! I love you @pattonoswalt I love you Alice Oswalt!" Salenger also posted a joke photo of her engagement ring with an image of Dwayne Johnson over her finger. "I don't wanna brag... but check out the size of The Rock on my finger!" she wrote. Johnson responded, "Happy 4 you guys. Congrats!" Oswalt cracked a "Star Wars" joke on Twitter and said, "I put the ring in a marzipan Slave I replica and said, 'Will you be my Padawan of Love?' She maced me but said yes later." It's certainly a happy development for Oswalt, who spoke to "48 Hours" in April of the heartbreak he faced after McNamara died. He said at the time, "I wanna talk to her so badly. I miss her so much. And I'm just sad all the time." Oswalt also said it's important to him to complete and publish McNamara's book, which is due out in 2018. The comedian has been frank about his feelings after McNamara's death and said that he decided to stop wearing his wedding ring in April, moving it into a special box for keepsakes. "I couldn't bear removing it since April 21st, 2016," he said. "But now it felt obscene. That anonymous poem about the man mourning his dead lover for a year and a day, for craving a kiss from her 'clay cold lips.' I was inviting more darkness. Removing the ring was removing the last symbol of denial of who I was now, and what my life is and what my responsibilities are." "So the ring goes with the happy stuff," he added. McNamara died from a combination of prescription medications and an undiagnosed heart condition. Oswalt told Tracy Smith on "48 Hours" that McNamara's quest to find the "Golden State Killer" took a toll on her health. He said the morning of her death, he laughed because she was snoring -- and then he found her hours later, still in bed, no longer breathing.